To you and your family: May 2016 be filled with Joy, Peace and Love! 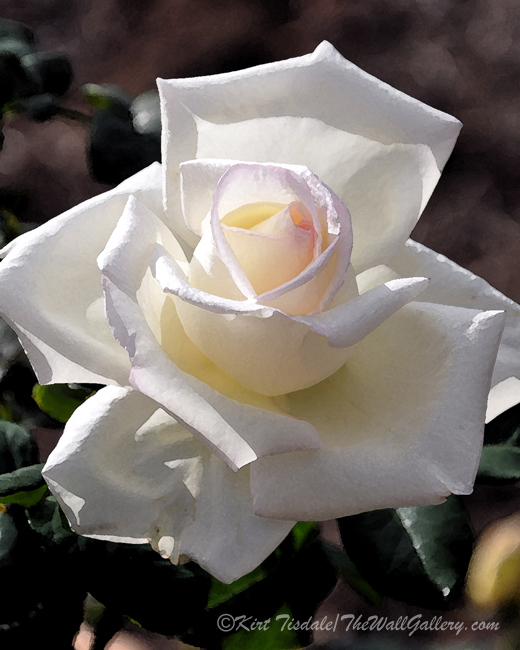 This entry was posted in Art Prints, Color Photography and tagged floral, interior design, kirt tisdale, online art gallery, rose bloom, watercolor art, White Rose on December 31, 2015 by Kirt D Tisdale. So, we are into the extreme hustle bustle of the season. I had the pleasure of spending Sunday afternoon at a large regional mall. Shopping in full swing, people coming and going, families with kids in tow…just what you would expect. 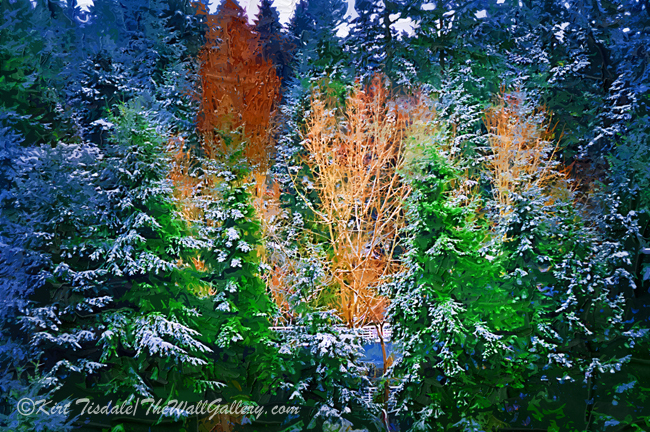 As the frenzy of the season comes upon us, my mind retreats to scenes of tranquility that represent the season to me. Having grown up in the Midwest and living in Denver for a number of years, my Christmas tranquility thoughts go more to the art prints I have attached. As a lover of nature and hiking in the woods, these scenes represent that place my mind goes at this time of year to seek a reprieve from the activity around me. The first one appeals to me because of the deciduous trees in the clearing that have lost their leaves for the season, yet are a focal point of light amidst the snow covered evergreen trees. The second print is the quiet of the forest with fresh snow…perfect hiking. 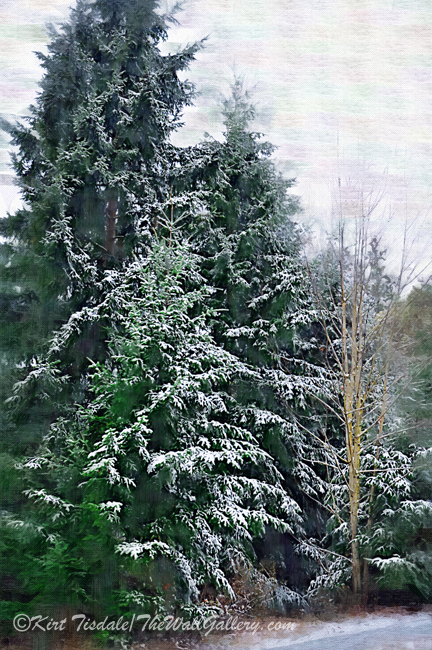 The third print is just another reminder of the beauty of snow on pine trees…. 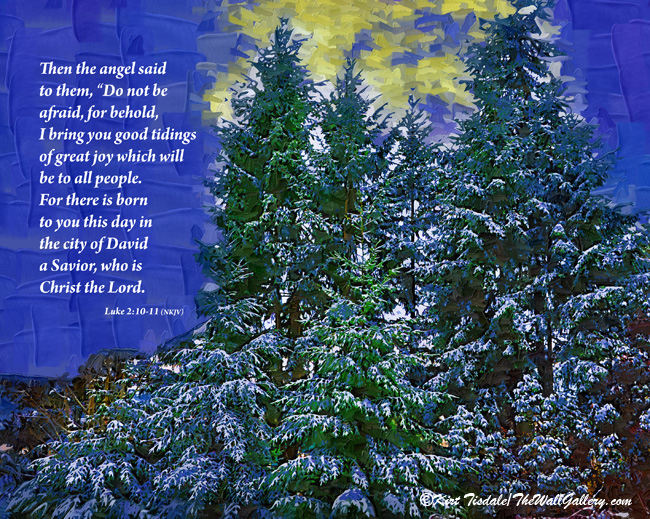 Take a moment and savor the quiet moments of the season….Thoughts? 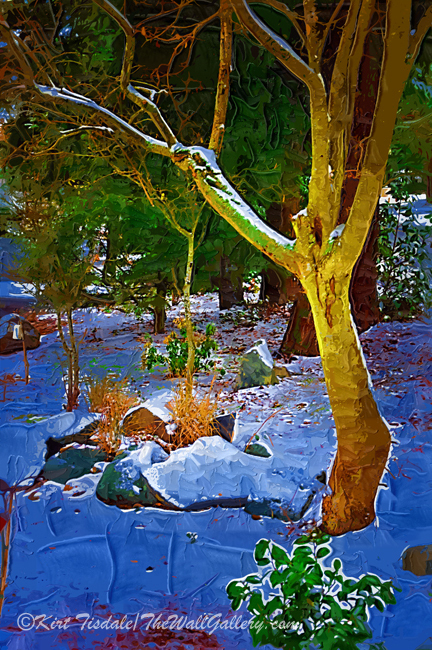 This entry was posted in Art Prints, Landscapes: Oil and tagged art gallery, artist kirt tisdale, forest, interior design, landscapes, online art gallery, pine trees, snow covered trees, winter wonderland on December 16, 2015 by Kirt D Tisdale. During the summer months in this part of the planet, we get what is called monsoon thunderstorms. Tropical moisture from the Gulf of California and the Pacific Ocean is pulled up into the desert southwest here in the United States. With the heat and higher humidity, thunderstorms build during the day, sometimes very quickly and then the downpours begin. They can exhaust themselves almost as quickly as they form. 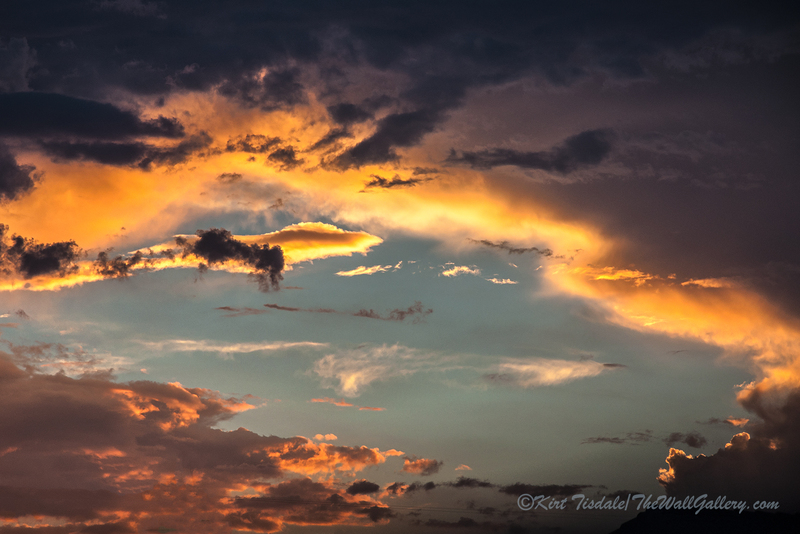 All of that is to say, we get some pretty spectacular looking clouds during this process. I have attached two particular shots as an example. These shots were taken on different days, but in the same area of the sky from our house. In both cases the sun was setting and enhanced the look of the pictures with brilliant color. I am getting ready to create two new prints for my Inspiration Gallery and had this overwhelming urge to locate two photographs such as these. This is a case where the picture is speaking to me before a bible verse or prayer. Sometimes it works that way, but usually I come across a verse or prayer first and then determine what art print or photograph to put it on. I’ll share the finished prints when I have completed them, but wanted to share these two shots. Thoughts? 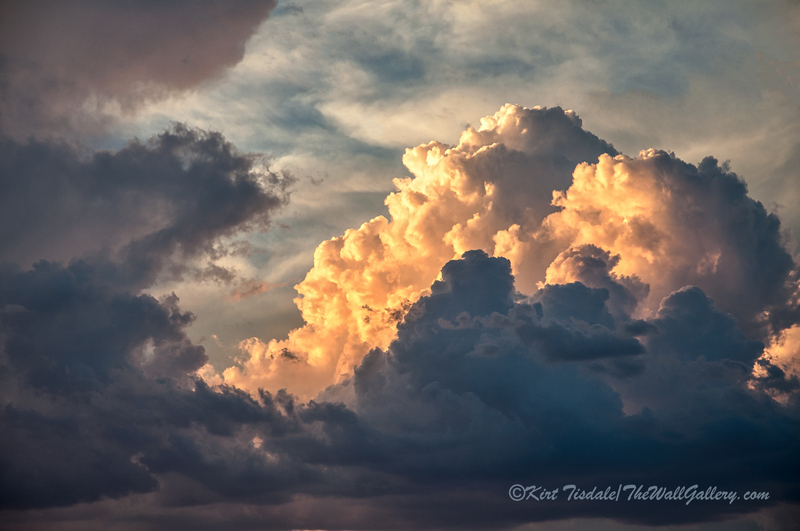 This entry was posted in Color Photography, Photography and tagged arizona, clouds, kirt tisdale, online art gallery, photographer, sky, storm clouds, sunset on December 8, 2015 by Kirt D Tisdale. When we were in the Pacific Northwest last June, on our way over to Henry Island, we stopped at an oyster farm on San Juan Island. I have to say…that was a first. I truly didn’t have any preconceived notions of what an oyster farm would look like or how it worked, so I found the entire experience fascinating. The operation is so incredibly interesting, but not much in the way of a photo shoot opportunity. That said, the old buildings and equipment immediately spoke sepia tone for that rustic and vintage look. 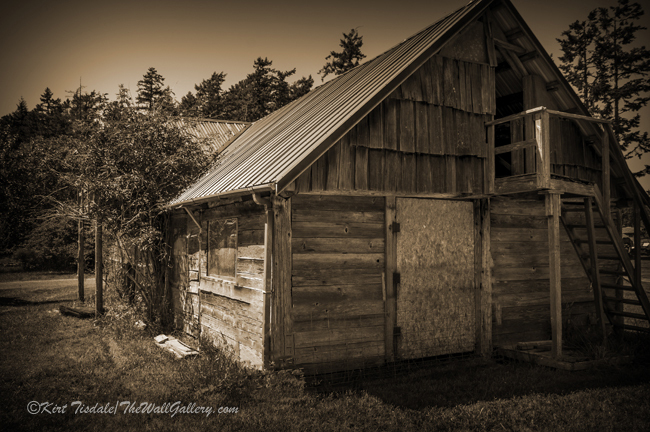 I finally settled on the attached four shots and just recently added them to my Sepia Photography Gallery. The first one is the main facility where the offices and transactions are handled. 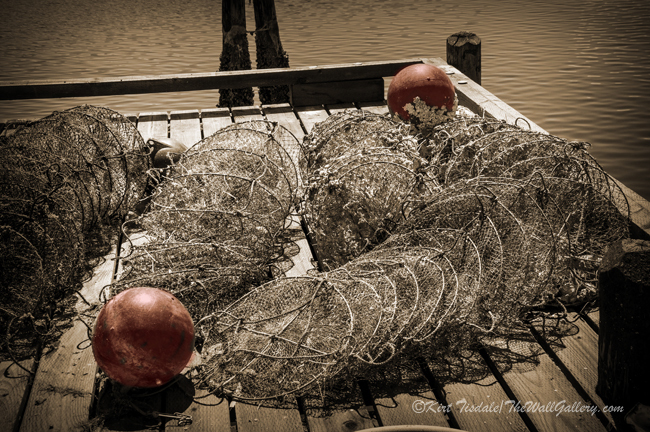 The red “Oysters” creates a subtle focal point (on a project I worked on for a client earlier this year, they bought a series of sepia tone prints and asked me to create a subtle red element in each one….I liked the look, so added that to three of these). The second shot is a storage shed on the property that they were talking about tearing down (they have since decided to keep it and upgrade it). The third capture is netting on the dock with flotation balls. Again, I used the touch of red as an additional element. 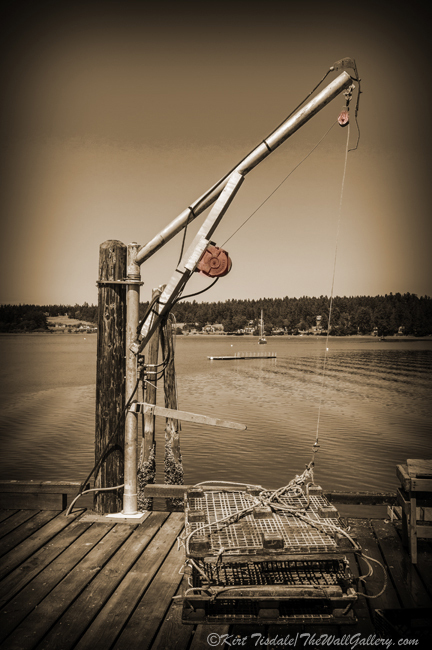 The fourth print is of a small crane on the dock used to lower and raise the containers of oysters in and out of the water. 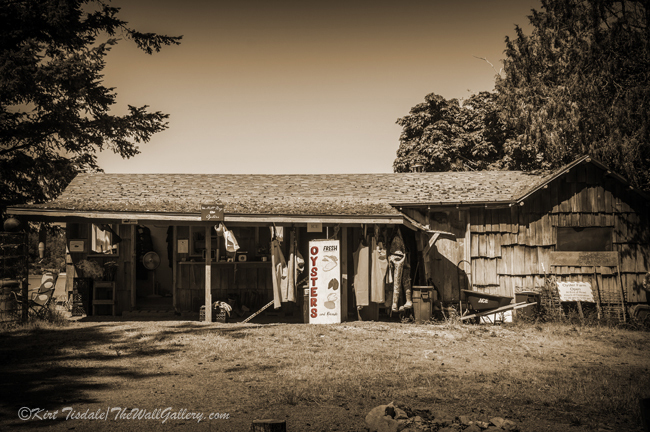 This entry was posted in Art Prints, Sepia Photography and tagged interior design, kirt tisdale, online art gallery, oyster farm, oysters, pacific northwest, photographer, san juan island, sepia tone on December 1, 2015 by Kirt D Tisdale.